We had two hugely important games this past week and we lost them both. Playing away to the USA and Costa Rica was always going to be a tough test but did we actually do as well as we might have? Let’s have a look. I am sure Dennis Lawrence, the coach, feels we should have got a result from both outings. Looking at social media, many fans also seem to think we should have got at least a point in both games. 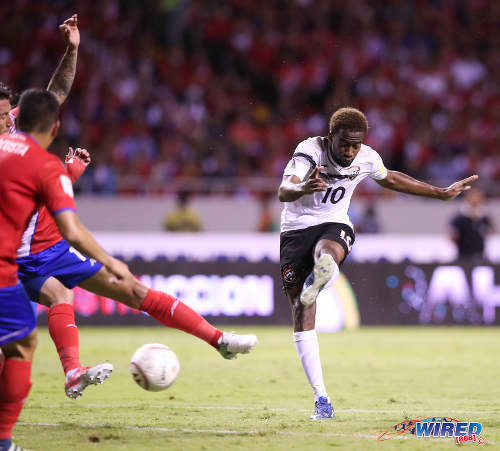 Photo: Trinidad and Tobago playmaker Kevin Molino (right) drives home an equalising goal during 2018 World Cup qualifying action against Costa Rica at the National Stadium in San José on 13 June 2017. The USA team is by no means their best squad but they are still good. They are tactically good and they also have the wonderfully talented Christian Pulisic in their line-up. But they were quite flat during the first half and we really missed a golden opportunity to take something from the game. We could so easily have taken the lead when Kenwyne Jones’ header came off the top of the bar but let’s be honest, we were never in control of the game. Our goalkeeper, Jan-Michael Williams, was much, much busier than Tim Howard in the American citadel. 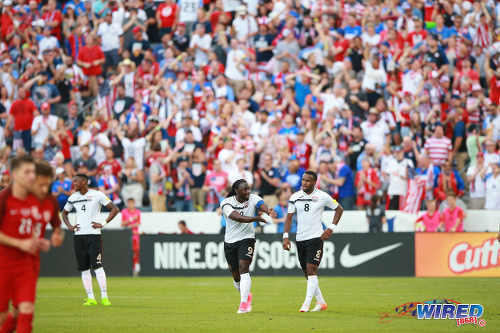 In the end, the USA deserved their victory as they had far more quality in midfield and in the final third. And we never got control of Pulisic with the result that he ran the show. As is the case with the USA, we have an abysmal record against Costa Rica. The Ticos appeared nervous for some reason but again we failed to capitalise. What is clear, though, is that the pressure during these qualification matches is real enough to affect even a fluent side like Costa Rica. We passed the ball well and, over the last two years, that’s an area where we have improved as a team. Stephen Hart was the architect of this mindset and it has continued somewhat under Dennis Lawrence although we are terribly sloppy at times, as was the case with Hyland when the USA scored their first goal. Hyland is a talented player but he needs to concentrate better and be tighter in possession. 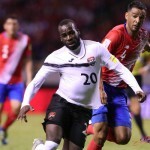 Photo: Trinidad and Tobago captain and forward Kenwyne Jones (centre) offers advice to midfielder Khaleem Hyland during 2018 World Cup qualifying action against the United States in Colorado on 8 June 2017. We should have had a penalty but, to the dismay of 1.3 million people, we didn’t get it. I am still more than a bit surprised by that. Although it looked as though the referee’s view might have been obscured, I felt that the linesman did have a clear view and should have seen it. I am going to be brutally honest here as it makes no sense sugar-coating anything. I don’t understand why so many people are saying that we are doing so well. We are not. True, we are passing the ball a little better and that’s good to see but we still lack quality in the final third and, most importantly, our concentration is simply not good enough. What I find most disturbing and really unacceptable is our inability to defend against set pieces. This tells me that players are not concentrating and not sharp. I just couldn’t believe my eyes when, in the first minute in San José, we conceded on the near post from a corner. That’s unforgivable anywhere but especially away from home! Were I the coach, I might have been sorely tempted to collar someone. 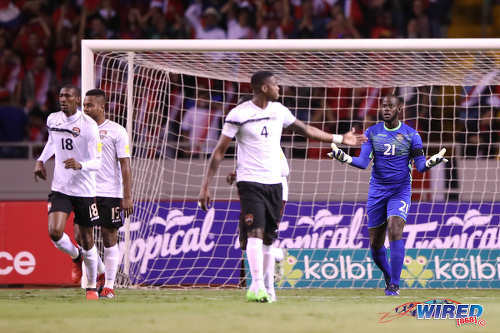 Photo: Trinidad and Tobago goalkeeper and captain Jan-Michael Williams (right) asks questions of his defence during 2018 World Cup qualifying action against Costa Rica at the National Stadium in San José on 13 June 2017. 27 May 2016: Uruguay 3, T&T 1. The second goal came from a corner. 3 June 2016: China 4, T&T 2. We twice conceded goals from set pieces, a corner and a free kick. 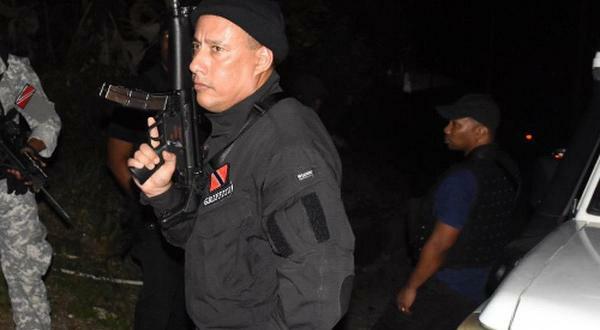 8 January 2017: Haiti 4, T&T 3. We conceded a goal from a quick free kick in the 20th minute and the second goal came thanks to a near-post header off a corner. Another header from a corner was cleared off the line, sparing us more blushes. 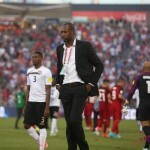 28 March 2017: Mexico 1, T&T 0. Not for the first time, the goal came thanks to a header on the near post from a corner. 13 June 2017: Costa Rica 2, T&T 1. Mere seconds into this most important game, we give up a goal from a corner, another near-post header. That’s shockingly poor defence! As that short history of our recent performances shows, we have been abysmal when defending against set pieces, very poor marking and lack of concentration evident. What is truly troubling about this observation is that all the teams in the Hex now know about our weakness from set pieces. They know that, to beat us, they don’t have to carve us open or break down our defences. To have a good chance of scoring, they merely need a corner or free kick out wide. 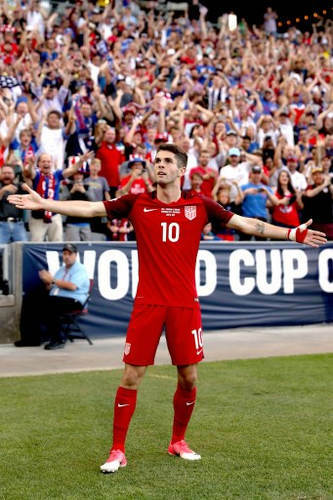 Photo: United States attacking midfielder Christian Pulisic celebrates his second goal against Trinidad and Tobago during Russia 2018 World Cup qualifying action at Commerce City on 8 June 2017. So yes, we are passing the ball much better. That, however, is only one facet, only a fraction of the game. We absolutely need to make it more difficult for teams to score. It is something that must be corrected in a hurry. Fortunately, the manager was a very able defender in his day and he has at his disposal on the technical staff, Sol Campbell, who is right up there with the best of them when it comes to defending. So Coach Lawrence will have his hands full but, between himself and the former Arsenal standout, they have to find a way to help these boys improve on that aspect of their play. It is important to note that we don’t create a host of chances or open teams up in open play so one has to wonder where the victories we so desperately need are going to come from. All in all, then, we need to improve very quickly. In my opinion, the boys can all improve their performances by at least 25% and we have to hope that, in addition to the positive stuff they are getting from the technical staff, they are all doing their own personal analysis of their own input and the team’s play. If they all do this essential work and produce the goods, we may still have a fighting chance to make it to Russia next year. 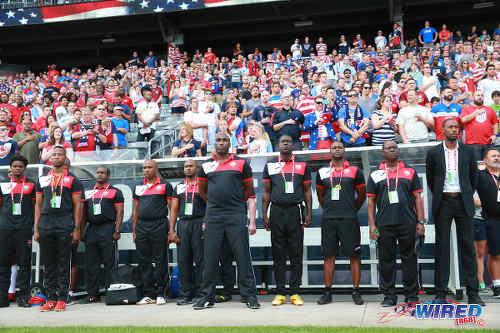 Photo: Trinidad and Tobago National Senior Team head coach Dennis Lawrence (far right) and his coaching staff prepare for kick off against the United States during the 2018 World Cup qualifying series on 8 June 2017. 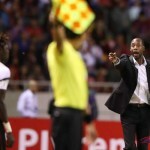 Lawrence and Molino: T&T matched Costa Rica stride for stride and should have had a penalty! Kelvin Jack is a former Trinidad and Tobago international football team goalkeeper and was first choice at the 2006 Germany World Cup although injury restricted him to one outing against Paraguay. Jack is an ex-San Juan Jabloteh captain and played professionally in the UK with Dundee (Scotland) and Gillingham (England). Ha ha when all is said and done all that matters in the three points. Whether you win or not. It doesn’t matter how good you think you improve. Sadly we’ve been consistently losing. So no we doing very badly. most of the players on this side dont need to be there and even if they are, they are well aware of what is needed from them as a football side. To be playing International football for over 5-10years for the country that you have born and bred in for and still giving “improved” and “OK” football. FOH and give someone else a try. The citizens of trinidad and Tobago deserves a football side that will give them fantastic football and great service. I like how Mr Lawrence continue the progress left by Mr Hart but there’s still alot of work to be done when coming to transition from attack to defence. Three of the four goals from the last round were contributed by us giving away the ball from the midfield . Never saw contending on a score sheet. It’s either win loose or draw . Right now we only see loose from this team. First time I ever see a team lose 2-0 and the coach say our tactics worked well! I stop studying T&T football after that yess! I’ve already managed my expectations. 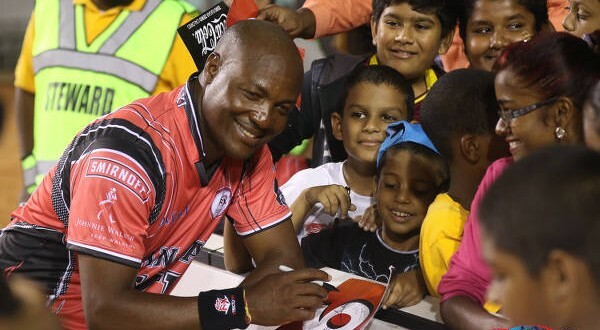 All I want to know is what’s T&T’s game plan for the World Cup in 2022. We jokie look how jokie the national super league president is also his club own coach ? So true our biggest problem we accept mediocre . We doing Ok we fighting we getting tied we r proud of d team’s effort. Improvement comes in increments. No one expects a miracle in half a campaign. Next four years though.. we want in. No joke, cutarse after cutarse could ever be doing good? Yes… this ‘honest’ analysis is a breath of fresh air. That’s constructive feedback! I have to agree in part with some of what Jack said. No more time for excuses. The team have improved somewhat and the overall performance is much better interms of matching the bigger nations. My problem is what is going on with the development program at the youth level and the local clubs. If a coach at a senior team level still have to be teaching a player how to concentrate and have more control of his game, then something is wrong with the player and how he is being schooled in the game. A senior national team is no place to be learning what you should have been thought long b4. So that tills me some of the players on the senior team just not cutting it and should not be there. You don’t see the likes of U.S. Mexico and CR having to work with players on how to trap and control a ball and concentrate for 90+ . What you see them working on is game management. So Coach Lawrence and his Tec.staff have a hard job if we expect them to be teaching players at that level how to do the bacis. What that tells me is we just don’t have it. The players just not up to standard. Not even the best coaches in the world would be able to manage t&t. Jack I’m sure when Don’ Leo came in as coach he did not have to teach you to cover your first post, or teach Latapy, York, Lawrence, Hislop, Carlos, and the rest of the 2005 team the bacis of the game. He just had to manage the players and put the best team on the field to get the job done. Finally, we need to stop call the Pro league, The Supper league and the player’s in it pros. 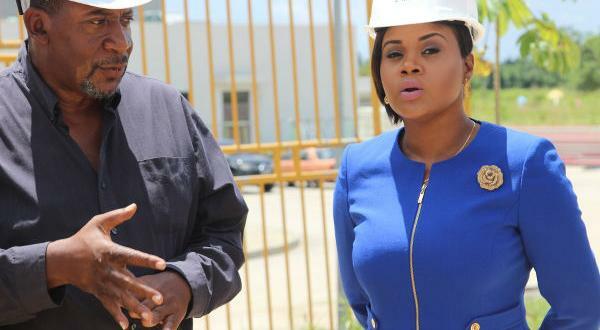 Sorry to say but we all no we don’t have anything professionally in Trinidad and Tobago. We just don’t. So stop fooling ourselves. One of the keys. Learning How to defend properly and also taking our chances are our most important things to do, so it is both sides of the ball. Concentration level need to be kept for 90+ minutes not only the first half. Better luck in the upcoming fixtures. Not good at all, a dictator, i hear. Does not take advice. Open up the venues , let us see our players play for free. The country is in a mess therefore it is unlikely to maintain any sport program of consistent excellence. Exactly the way I see it. I’ve seen improvement for sure in possession game and passing. The final third for sure needs improvement. I’m always wondering where the goal is gonna come from although the boys have been threatening. The Mexico and Costa Rica games were very good but in the Costa Rica game they weren’t nasty and mean enough or scrappy. All in all they deserved at least 2 points in the last three games. Hopefully they turn up all the way until the end. They’re playing fairly well. The issue is to keep up that 1st half tempo! And to execute of course. It’s only a couple of mistakes and calls that went against us that have us in this position. That game against Costa Rica was probably the best they’ve played throughout the hex. Our backs are against the wall, we need to win against Panama and Honduras. I think we need to learn how to play football ….. for at least 90 minutes. Expecting Trinidad to excel at sports is like expecting a child from a severy dysfunctional home to achieve in life, it requires special intervention or genius. Sports tourism is politics if we are talking about local sports. We have no sports teams to attract tourists. If we are talking about putting on international contests because we have the facilities, that’s another story. That’s my point. 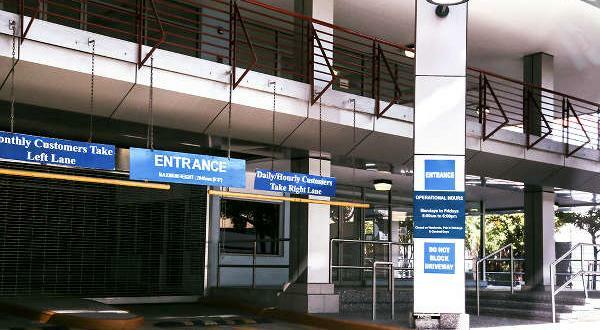 Even with facilities as we have now , investing locally will enhance the product. It’s not rocket science why so many people think we are doing so well. When you have become anesthetized to the poor quality of football we have displayed over the years and that includes Stephen Hart’s teams, we begin to have lowered expectations. So when we manage to string a few passes together we are happy because we are not used to that. When we can threaten the goal of a decent opponent that’s progress. So we forget that we were once a team that played pretty decent football. Defensively what can Saul Campbell bring to a team which does not know they must mark on the inside of a player when protecting your goal, Are you going to tell me in 2017 we don;t know that. With all the international football on tv we don’t observe how defenders make it difficult for opposing forwards to get to the spot on the field that they want. This guy was standing wide open unmarked. Not even the goalkeeper called out his defense. The fundamentals of football have not changed and the time to learn them is at the youth level so when you reach to this level you don’t have to think about what you are supposed to do, you react accordingly. A cold glass of water called reality to the face. Lol. Lasana Liburd What local time is the opening Confederations Cup game? I agree our defence against set pieces leaves a lot to be desired, I thought Tim Howard had to work harder than I’ve ever seen am American keeper had to vs us, which showed we did produce more chances than we did in previous encounters. Ebb and flows are important and the fluffed penalty call was critical, had that call been made it would have made us stronger and the Ticos desperate and open up more. Simply put, practice makes perfect. WHAT SENCE DOES IT MAKE HAVING SO MANY STADIA IN THIS COUNTRY AND WE CANT SEE A DECENT FOOTBALL MATCH EVERY WEEK, WE NEED TO FORGET THE MONEY AND UTILISE OUR FACILITIES ,MAKE IT SO THAT WE CAN CARRY THE YOUNG ONE TO SEE A FOOT BALL MATCH WITHOUT HAVING TO PAY. There was a time in the golden age of Brazil when you didn’t worry about how many the opposition scored because you knew you could outscore them. But those days are long gone, stabbed through the heart by European (mainly German and Italian) defensive efficiency so I hear you, my brother. But forgive me for my nostalgia; I’m sure we spectators would all be better off if we could bring back those days when the game was truly the beautiful game.